There’s a very specific reason I made this comic. And it is the darkest comic I’ve made or will make. On the info page of this website I addressed this briefly, but I resolved to make ONE propeller comic. The reason is that Man versus Manatee is meant to be entertaining, but also educational. Even if the comics alone don’t tell the full story or give my reader all the information they need, the comics should inspire further research. Knowing about the leading cause of death for manatees is very, very important. So I’d be doing the curious a disservice not to mention it. 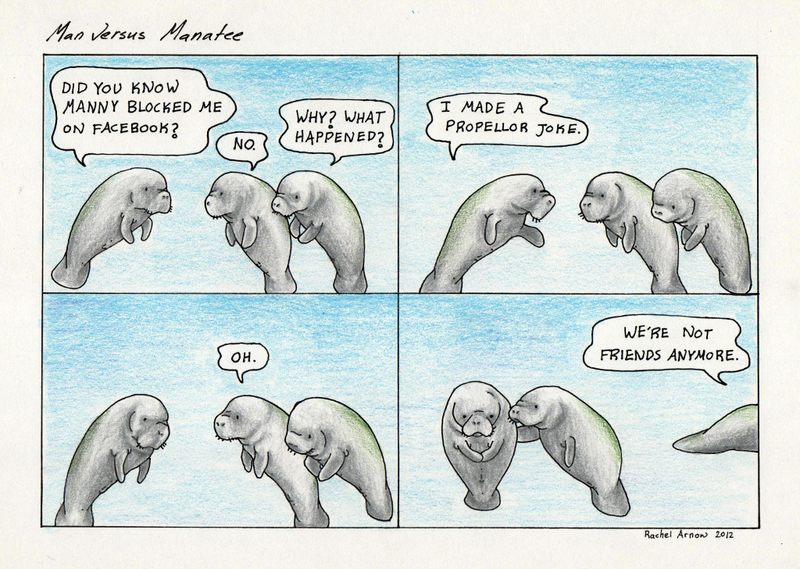 This is a one-time deal, as I dedicate Man versus Manatee as a whole to a positive representation of the manatee. Keep this goal, and my goal for subtle education in mind, and my reasoning will be clear. Its okay. I thought it showed a whole lot about how you care about spreading the word that things like this can happen. Also, I read this one for the first time when people where making jokes about Ebola. It was perfectly fine to make this comic because it shows that HELLO! Jokes about things that kill people are SO not funny. It can make you lose friends. So good job. Ignore the mean comments and focus on the fact that you made a difarance. comics like this show that the writer knows a lot about manatees and wants to spread the word that speeding in manatee zones is wrong. Keep it up, Rachel! !